At long last, high–end sophistication has merged with down–to–earth affordability to create the unique Queen Anne reception office furniture collection. 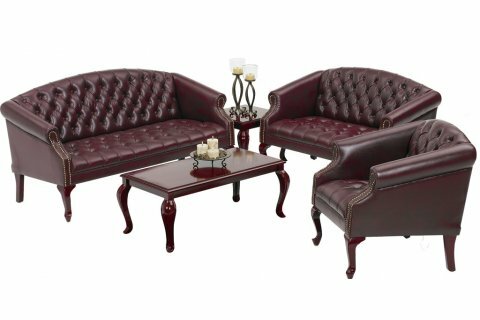 This collection offers you a beautifully contoured chair, love seat and sofa in deep, rich oxblood vinyl, studded with traditional nail-head trim. 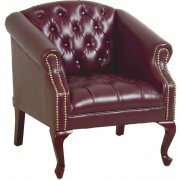 Durable, yet elegant Burgundy faux–leather with brass nail–head trim. The optional matching mahogany–finished, solid wood Queen Anne tables are a study in classic elegance with its smooth finish and gorgeously curved legs.